PART OF THE NEIGHBOURHOOD SINCE 2009. A taste of Belfast in Leslieville. The finest pub fare, whiskies and imported/local draughts in Toronto's east end. Open daily for lunch & dinner. Traditional Irish breakfast served on weekends and holidays. Our kitchen is open daily at 11:30 a.m. & closes 2 hours before last call. Customers in the pub are our priority, but when able we will accept take away orders (except for dine-in only specials). Menu items are best enjoyed in-house as some are not suited for travel. Visiting us gives you the best experience - besides, your friends are here ! Fresh-cut chips with curds and gravy. Fresh-cut chips topped with chicken, curds & curry gravy. Crispy, battered florets. Plain or tossed in wing sauce. DECLARED BY SOME AS "BEST IN THE CITY"! Jumbo, fresh, never frozen, locally sourced, cooked to order. Served with carrots, celery sticks & blue cheese dip. Dressings: house vinaigrette, balsamic vinaigrette, ranch, blue cheese, Caesar. Fresh mixed greens, tomato, cucumber & carrot. Grilled flatiron steak, Feta cheese, red onion, beets, served on a bed of fresh greens. Grilled chicken breast, bacon, avocado, tomato, hard-boiled egg & blue cheese served on fresh greens. 8 oz. of thinly sliced, tender, slow-roasted beef on a fresh ciabatta bun with horseradish mayo, served with au jus. Grilled chicken breast, bacon, tomato, lettuce & mayo on toasted multi-grain bread. Cheddar & Swiss on multi-grain bread. 8oz. of Lean Pastrami, Swiss cheese, sauerkraut & 1000 Island dressing on a soft toasted bun. 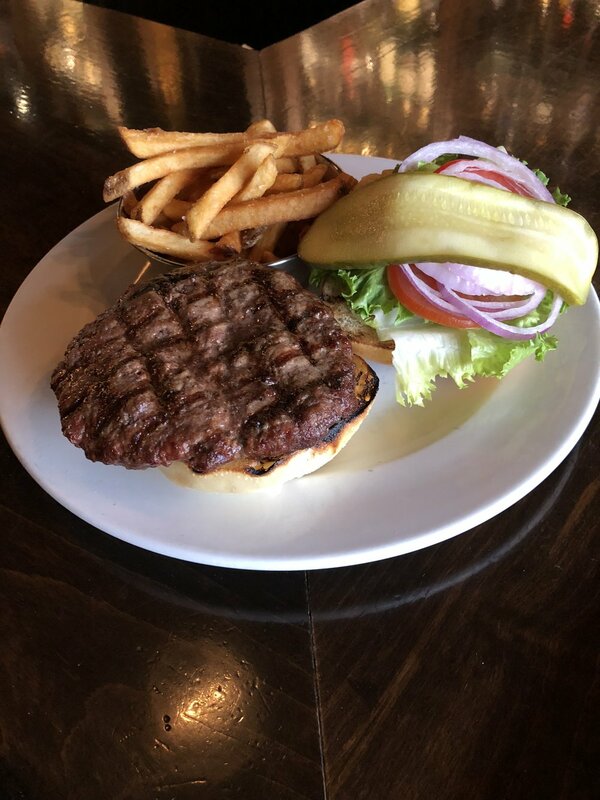 House made with only 100% premium Ontario Beef.Naturally raised & hormone free.Garnished with lettuce, onion, pickle & tomato. Served with fresh-cut chips, mashed potatoes or side Publican salad. Blue cheese & beer-braised onions. Topped with Monterey Jack Jalapeno & fire-roasted jalapeno salsa. garnished with only an onion ring * No Substitutions please. Made from a mixture of organic whole grains & vegetables. + Starving? Add an extra patty! Authentic butter chicken curry served with basmati rice & peas, butter brushed naan, topped with fresh cilantro. Order medium or hot. Mixed veggie curry served with basmati rice & peas, butter brushed naan, topped with fresh cilantro. Order medium or hot. Crispy 8oz. beer-battered North Atlantic Cod filet, served with coleslaw & tartar sauce (on request). Tender chicken, onions, celery, carrots. corn & peas, in a rich sauce topped with puff pastry, served with vegetables and choice of mashed or chips. Tender beef & mushrooms in a rich Guinness gravy, topped with puff pastry, served with vegetables and choice of mashed or chips. Naturally raised beef, carrots, peas & corn in a rich gravy, topped with homemade mashed potato, served with side Publican salad. The Roy’s in-house signature dessert! Sweet, delicious & smothered in toffee syrup. Served with whipped cream. Served Saturdays, Sundays & Holidays til 3pm. Full menu available all day. 2 farm-fresh eggs, 2 bacon strips, home fries and toast. 2 farm-fresh eggs, banger, peameal, home fries, beans, grilled tomato and toast. Poached eggs on top of peameal bacon and English muffin covered with hollandaise sauce. Served with side house salad. Poached eggs on top of English muffin with sliced Pastrami & sauerkraut, covered with hollandaise sauce. Served with side house salad. 2 eggs with your choice of 3 items: red onion, mushrooms, cherry tomato, beer-braised onions, Blue, Cheddar, Feta, Swiss. Served with side house salad and toast. Standard Imperial 18oz. and half (9oz.) pints. Alcohol, bottles and tins, oh my! Served by the 6 oz. glass, half litre or bottle. Our house pour is a generous 1.75 ounces. Premium pours are 1.5 ounces. Cosmopolitan • Elyx'r • Plymouth • Negroni • The "Jimmy"
Daily specials from 5PM. Available for dine-in with drink purchase. Tender prime rib with Yorkshire pudding, gravy, mash and veg. The same jumbo “roasters” you'll find at regular prices any other night! No take-away. Naturally raised, hormone free Ontario beef. *Available all day. 2 can dine for $45.00! Crafted by our chef weekly. Check the board or ask your server for details. We're located at 894 Queen Street East in the heart of Leslieville. Come and enjoy a pint around the bar. Sit with friends and family for lunch, dinner & brunch. We accept Cash, Debit, Visa & Master Card. Groups of 6 or more will be subject to an automatic gratuity of 18%. Please note that during busy times, take-out orders may not be possible. * Some items not available for take-out. The Roy is an adult space. We welcome attended, well behaved children. Strollers are not allowed inside the pub.